Mouse anti Human CD44 antibody, clone 156-3C11 (MCA2726) used for the determination of CD44 expression on small cell lung cancer cells by flow cytometry. SCLC cell line OH-1 binds to selectins and expresses CEA. OH-1 cells, as a cell line of neuroectodermal origin, are positive for NCAM and EpCAM, which could be detected by flow cytometry analysis and can thus serve as a marker for these cells when grown in mice. Cells show binding to E- and P-selectin fusion protein. The glycosylation motif sialyl Lewis A, a binding partner recognized by selectins, could be detected with the CA19-9 antibody. The cell line OH-1 exhibits several known proteins which known to be protein backbones for selectin binding carbohydrate residues such as PSGL-1, MUC18, CD44 and CEA. Isotype controls are shown as dotted lines. From: Heidemann F, Schildt A, Schmid K, Bruns OT, Riecken K, Jung C, et al. (2014) Selectins Mediate Small Cell Lung Cancer Systemic Metastasis. Mouse anti Human CD44 antibody, clone 156-3C11 used for for the determination of CD44 expression on human small cell lung cancer cell (OH-1) tumors in mice by immunohistochemistry. Spontaneous OH-1 metastases express CEA. 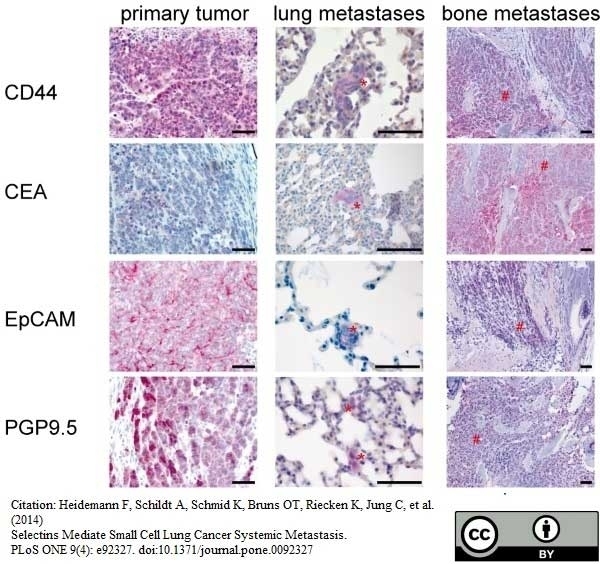 Primary OH-1 tumor as well as spontaneous OH-1 lung and bone metastases were positively stained for CD44, CEA, EpCAM and PGP9.5 (red = positive cells). Metastases are indicated by red asterisks. Scale bar: 50 μm for all panels. Mouse anti Human CD44 antibody, clone 156-3C11 used for for the determination of CD44 expression on human small cell lung cancer cell tumors by immunohistochemistry. Decreased survival of SCLC patients with moderate CEA expression levels. TMA of SCLC patients was immunohistochemically stained against CEA. Three patient groups were discriminated: (D) no CEA expression (CEA−), (E) moderate CEA expression (CEA+) and (F) strong CEA expression (CEA++). Kaplan Meier survival curves show significantly decreased median survival of patients with moderate CEA levels compared to patients with (A) negative (log-rank test, p = 0.0054) or (B) strong CEA levels (log-rank test, p = 0.0002), but no significant difference between median survival of patients (C) with negative compared to strong CEA levels (log-rank test, p = 0.1016). In parallel a TMA of SCLC was immunohistochemically stained against CD44. Two patient groups were discriminated: (H) CD44 negative (CD44−) and (I) CD44 positive (CD44+). Kaplan Meier survival curve shows no statistical different median survival of patients (G) with negative CD44 levels compared with patients with positive CD44 levels (log-rank test, p = 0.7). Scale bar = 200 μm. Mouse anti Human CD44 antibody, clone 156-3C11 used for the evaluation of CD44 expression on JIMT-1 breast cancer cell lysate by western blotting. From: Olsson, E. et al. CD44 isoforms are heterogeneously expressed in breast cancer and correlate with tumor subtypes and cancer stem cell markers. BMC Cancer. 2011 Sep 29;11:418. Mouse anti Human CD44 antibody, clone 156-3C11 (MCA2726) used to evaluate CD44 expression on feline renal cortical fibroblasts from healthy and diseased animals by immunofluorescence. 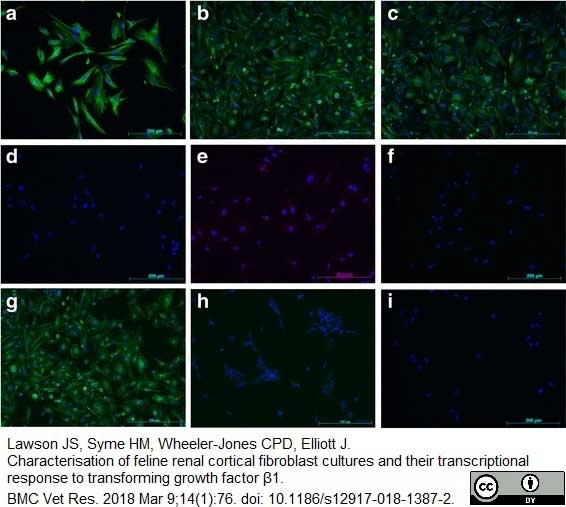 From: Lawson JS, Syme HM, Wheeler-Jones CPD, Elliott J.
Characterisation of feline renal cortical fibroblast cultures and their transcriptional response to transforming growth factor β1. BMC Vet Res. 2018 Mar 9;14(1):76. Mouse anti Human CD44 antibody, clone 156-3C11 recognizes human Phagocytic glycoprotein 1 also known as CD44, HCAM or CD44s. CD44 is a ~90 kDa single pass type I transmembrane glycoprotein. Various isoforms of CD44 exist due to differential expression of exon products form the membrane proximal region of the extracellular domain. Mouse anti Human CD44 antibody, clone 156-3C11 recognizes the ~90 kDa standard form lacking any of the alternative spliced products, the clone is expected to recognize all isoforms of CD44. CD44 is expressed on leucocytes, erythrocytes, white matter of the brain and some epithelial cells of the breast and small intestine. Antibodies produced by clone 156-3C11 recognise epitope 3, defined as a protease resistant epitope on the CD44 molecule (CD44 and CD45R Cluster report. In Leucocyte Typing V. White cell differentiation antigens. Eds Schlossman, S.F. et al). CD44 is a receptor for hyaluronic acid (HA) and is involved in cell-cell interactions, cell adhesion and migration (Lesley et al. 1990). CD44 also participates in a wide variety of cellular functions including lymphocyte activation, recirculation and homing (Shimizu et al. 1989). CD44 expression may be up-regulated upon some carcinomas, and it has been speculated that this may be related to metastatic potential (East and Hart 1993). MCA2726 detects a band of approximately 80kDa in HeLa cell lysates. Denning, S.M. et al. (1995) CD44 and CD45R Cluster report. In Leucocyte Typing V. White cell differentiation antigens. Eds Schlossman, S.F. et al. Olsson, E. et al. 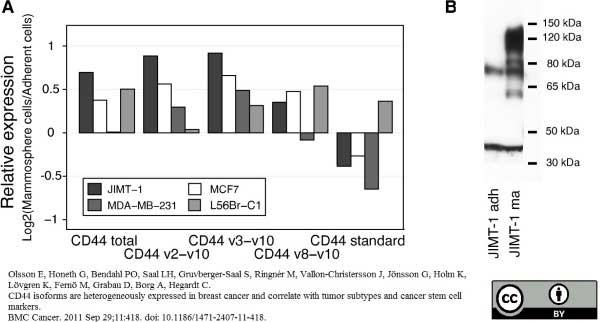 (2011) CD44 isoforms are heterogeneously expressed in breast cancer and correlate with tumor subtypes and cancer stem cell markers. Alves, C.S. et al. (2009) Biomolecular characterization of CD44-fibrin(ogen) binding: distinct molecular requirements mediate binding of standard and variant isoforms of CD44 to immobilized fibrin(ogen). J Biol Chem. 284: 1177-89. Heidemann, F. et al. 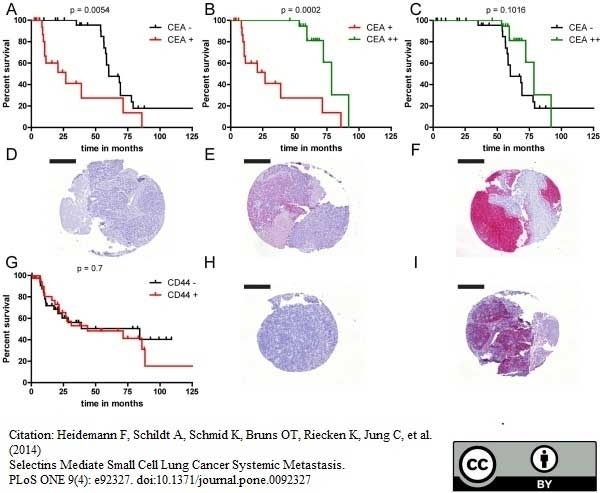 (2014) Selectins mediate small cell lung cancer systemic metastasis. Zhang, D. et al. (2015) Screening and Identification of a Phage Display Derived Peptide That Specifically Binds to the CD44 Protein Region Encoded by Variable Exons. J Biomol Screen. pii: 1087057115608604. Zhang, P. et al. (2014) CD44 variant, but not standard CD44 isoforms, mediate disassembly of endothelial VE-cadherin junction on metastatic melanoma cells. FEBS Lett. 588 (24): 4573-82. Pinto, F. et al. (2014) T-box transcription factor brachyury is associated with prostate cancer progression and aggressiveness. Clin Cancer Res. 20 (18): 4949-61. Afonso, J. et al. (2015) CD147 and MCT1-potential partners in bladder cancer aggressiveness and cisplatin resistance. Mol Carcinog. 54 (11): 1451-66. Lawson, J.S. et al. (2018) Characterisation of feline renal cortical fibroblast cultures and their transcriptional response to transforming growth factor β1. BMC Vet Res. 14 (1): 76.